I was asked to create a minimal Debian image, which would allow users to create their own image with the software they want and need, while still having the option to install everything I offer in my repository. So here's a very minimal Debian Jessie image for the ODROID XU3/XU4 series. It's just a headless server image only with user root at the moment. But it has all my repositories included, which allows for easy installation and updates of packages such as Kernel and Headers, or Kodi, or Chromium Browser, or whatever. The image has my usual setup: means on first boot it's resizing the rootfs partition and configures SSH. It will automatically reboot after the initial setup after which this image is ready to use. Kernel and headers are already installed if you need to build your own drivers. A few basic tools such as ntp, htop, mc, vim and bash-completion are already installed for your convenience. It's ready to be used as a server image. please note: not all Desktop Environments are working perfectly on the ODROID, best choises probably are LXDE, and MATE, but XFCE and KDE should works as well. If you are a more experienced user instead of tasksel you can always install the packages you want manually and therefore keep the image as slim as you want. It's also recommended to create a new user account for the Desktop environment and NOT to logon as root. After a reboot you should see a graphical login for your Debian Jessie image. I also advice you to install ffmpeg from Debian repository, it's a very good tool to watch and convert videos and well maintained from experienced Debian developers. Most of the packages available in my repository are X11 based, for example the malit628-odroid package are X11 GPU drivers, or Kodi, is only available for X11, so you need a Desktop environment to use them. Also, I haven't installed all drivers and firmwares available. If you want to use Wifi Model 4 you might have to install the firmware-ralink package first available on standard Debian repository. If you find any bugs please let me know, and if anyone else wants to, I can easily convert this image for ODROID X,X2,U2/U3 and C1. If you install a Desktop environment you should already have keybord-configuration installed, it will ask upon the first installation what keyboard layout it should use. This configuration is for your X11 Desktop so you have your desired keyboard layout. should be all that is needed to change your keyboard layout. export CHROMIUM_FLAGS="$CHROMIUM_FLAGS --use-gl=egl --ignore-gpu-blacklist --disable-accelerated-2d-canvas --num-raster-threads=4 --audio-buffer-size=4096"
Last edited by meveric on Tue Aug 23, 2016 12:39 am, edited 12 times in total. Thanks for this image meveric, it's really great! I have to change "without-password" to "yes" before I could log in over ssh. I would love to have this image for the C1+ also. Yes it's the default for Debian Jessie, I haven't touched the image. So the default is still active. I can look into converting this for the C1, but there I actually have to activate password login via SSH, since C1 has issues with output on terminal. It's really hard to work with the C1 using a TV and just a terminal output. Ok, thanks for the info. For me it's not a big deal to edit the SD card before using it the first time. I usually edit hostnames, etc. anyway. HI, WHAT version of debian is this? I know it's jessie but 8.1/8.2 or? It was build just a few days ago, so it's based on 8.2, although stuff like this normally doesn't matter much, you just do a normal system update and you always have the newest version. meveric wrote: It was build just a few days ago, so it's based on 8.2, although stuff like this normally doesn't matter much, you just do a normal system update and you always have the newest version. I need one for my c1+, can you help? also, can you tell me what network manager is used in this os??? I will make a C1 image soon.. depending on how much time I have it might only take a day or two. If you install a Desktop on top of it, it will use Network Manager. meveric wrote: I will make a C1 image soon.. depending on how much time I have it might only take a day or two. ...but I'm running out of test boards. Shuffling C1s around would've been easy at this weekend but I got only one spare XU4. make: *** No rule to make target `common'. Stop. any idea why my monitor won't detect your OS? I am using a hdmi to dvi cable, the dvi part of my monitor works because it works with my desktop. it won't detect your OS or show anything on my screen. Great image, just a heads up there is a typo in your post. kingdev1958 wrote: any idea why my monitor won't detect your OS? normally these boards are directly connected via HDMI, DVI is sometimes having issues. Still i've seen there were some improvements in that field, so I uploaded a newer version of this image with a new boot.ini included. There is a new option to set the system for DVI mode. Please note: you can alter the boot partition with the boot.ini on any system, even on a Window PC by hand, so if you don't want to you don't have to flash a new image. bujiryu wrote: Great image, just a heads up there is a typo in your post. Thanks, I fixed the typo and added some info about samsung firmware for hardware decoder. Hi Meveric Thanks for this Image. I have a question if i install kodi will libcec auto install too? If so wich version of libcec will be installed libcec3 or libcec3.0.1? And if i install kodi the blackscreen ibug is solved? Since kodi does not REQUIRE cec it's not a dependency, but you can install libcec manually which is libcec3 that's needed for Kodi. Black Screen Issue has not yet been solved, but the drivers on this image should reduce the issue greatly. It has occasionally crashes, but they are normally very rare, the black screen should not be much of an issue with that image. I couldn't get it working on TWO of the same 1080p monitors, used your new boot.ini and it worked great on BOTH of my monitors! Running i3, gonna have to tweak it tomorrow to get all my apps etc installed but, it's working! Quick question, how can I update chromium? it's running version 41, isn't that old? ALSO, Just saw you've released an image for the C1+, you really are great! will post in that thread too. Any ideas why xbmc doesn't launch? Error is XBMC needs hardware accelerated OpenGL rendering. Install an appropriate graphics driver. Kodi also doesn't launch, it starts to, says segmentation fault when launch from a terminal. 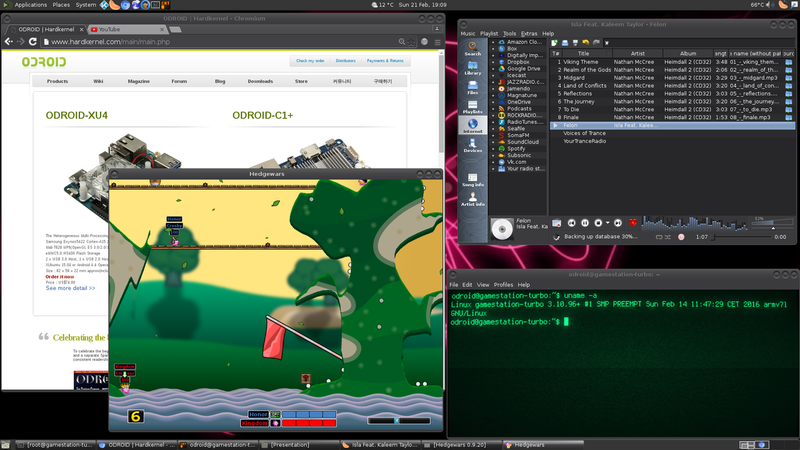 I have xf86-video-armsoc-odroid, xf86-video-armsoc-odroid, and firmware-samsung installed along with LXDE. bujiryu wrote: Any ideas why xbmc doesn't launch? Error is XBMC needs hardware accelerated OpenGL rendering. Install an appropriate graphics driver. Kodi also doesn't launch, it starts to, says segmentation fault when launch from a terminal. I have xf86-video-armsoc-odroid, xf86-video-armsoc-odroid, and firmware-samsung installed along with LXDE. These are the 3D GPU drivers which are needed for XBMC/Kodi as well. Kodi package had a missing dependency, but i fixed that just a couple minutes ago.. Do a apt-get dist-upgrade and you should have the new Kodi package. If XBMC still issn't working, let me know and I'll check on it. i have installed malit628-odroid, sorry bit of a typo in my post. Kodi is working now though so thanks. I did a fresh image, upgraded and installed everything and tried XBMC again with no luck. Thanks for your help though! I'll check on XBMC tomorrow to see what could be the issue. I think i remember that XBMC was always checking for OpenGL and needed mesa libs installed for this, even if it wasn't using them, I'll see what I can find out. I installed kodi and i noticed that deinterlace is not working or maybe i'm using the wrong settings watching live tv. Do i also need for using cec an external cec adapter cause it cannot initialize cecadapter. Does this mean it cannot find my tv or a external adapter? Is it also possible to install kodi 16 jarvis beta 2? Last edited by Pienoet on Wed Nov 25, 2015 7:20 am, edited 1 time in total. Really nice distro. It is really reactive and fast. May I suggest a few improvements ? * The boot should maybe not be based on the UUID as the one which is generated during installation (at least on my SDcard) is the same as the UUID of the ubuntu on emmc. After booting from SD card (Deb Jessie) with an emmc attached (with official ubuntu), the update on the boot.ini ended being written on the emmc /boot ! This totally messed up both my distros and trying to boot the ubuntu lead me to Jessie ! Solution : why not use boot=LABEL=GameTurboStation ? Being really upset with not random UUID, I label the SDcard and I can boot any distro I like from it without having to remove the emmc (and me being confuse with which "/boot" belong to which card. * Trying to use French keyboard. The set-up disappear after each reboot under X11. Also .. configuring console with french keyboard is not working ( may be this is related to debian itself). Would it be possible to include the packages needed for configuring in other language and keyboards and manage these configuration to become persistent ? * I didn't find the lsusb command. Could it be added please ? * If the IRDA modules could be package, that would be great. Many thanks for this great job. Karamell wrote: * The boot should maybe not be based on the UUID as the one which is generated during installation (at least on my SDcard) is the same as the UUID of the ubuntu on emmc. After booting from SD card (Deb Jessie) with an emmc attached (with official ubuntu), the update on the boot.ini ended being written on the emmc /boot ! This totally messed up both my distros and trying to boot the ubuntu lead me to Jessie ! It's done out of convenience. Most ODROID images use the same UUID, even though different devices. Means, the XU3 images have the same UUIDs as the C1 images and so on. It makes it much easier to keep track of the different images while keeping the changes to a minimum. Also changes on boot.ini from hardkernel can be used directly on each other image. Yes it will have an issue if you have eMMC and SD card connected at the same time. But you'll have the same issue if you have two Ubuntu images on the same board as well. You can have Ubuntu 14.04 image and 15.04 image on eMMC and SD card and they will conflict as well. After that you have to change the boot.ini and the /etc/fstab entry. Karamell wrote: * Trying to use French keyboard. The set-up disappear after each reboot under X11. Hmm that's odd, upon installation of a Desktop it's asking me for Keyboard Layout. I chose german and from that point the X11 desktop was always with german keyboard leayout. What terminal are you using? And what Desktop Environment? Karamell wrote: Also .. configuring console with french keyboard is not working ( may be this is related to debian itself). I had this as well. Strangely enough it's working just fine for me on my GameStation Turbo image, which is already a premade desktop image. I will compare and try to find out what packages are involved in keyboard-layout. I know "keyboard-configuration" is one of the packages used for this. Karamell wrote: Would it be possible to include the packages needed for configuring in other language and keyboards and manage these configuration to become persistent ? I prefer not to add many packages. This is meant as minimal image. I already published a premade Debian Jessie Desktop images that work perfectly fine, but this image is mainly for people who want to build their own system the way they want it, which means I don't want to install too many packages that others might not want to use. Still If I find out what's needed to get keyboard layout to work correctly I will make a note for it in the OP so everyone can change it easily if they want to. Karamell wrote: * I didn't find the lsusb command. Could it be added please ? Karamell wrote: * If the IRDA modules could be package, that would be great. If it's firmware that's missing you probably need to search the firmware-* packages for it, that are offered from the Debian repository. bujiryu wrote: i have installed malit628-odroid, sorry bit of a typo in my post. Kodi is working now though so thanks. I did a fresh image, upgraded and installed everything and tried XBMC again with no luck. I checked on XBMC and it tries to start glxinfo to determine what kine of 3D acceleration it's having. Awesome! I will check this out later, but I'm sure it'll work now! Thanks for all your help and your great images! I added some information about how to change language for both desktop and console to the OP. Need to get 18.0 MB of archives. After this operation, 82.9 kB of additional disk space will be used. The directory /lib/modules/3.10.92+ still exists. Continuing as directed. It gave me a big warning about replacing the same kernel and that I would need to reboot after. Is this all OK and normal? The Kernel version did not change it's still 3.10.92+ there were only minor changes. Moved my NAS from the Ubuntu minimal image over to this Jessie image and everything works good. Still can't compile new V4L-DVB device drivers however, but I think this is due to the kernel version being <4. Good job. Your repo? Is there debian official repo for arm? Yes, Debian has it's own armhf repositories. These are included and the image is based on these official repositories and packages. If you install software like apache, php, libreoffice, or samba, etc. it's all getting downloaded and installed from official Debian repositories. I created a repository for ODROID specific software, such as Kernel and Header, and may programs/games that I compiled for ODROIDs and armhf in general. Most games are written for OpenGL and therefore they don't work on ODROIDs which only supports OpenGL ES, I collected software that runs under ODROIDs either using OpenGL ES or glshim a OpenGL -> OpenGL ES wrapper. I wanted to use an IR remote control with Sigmatel IR USB dongle. I managed to compile new kernel with IRDA support but somehow even if module is loaded, LIRC is not working. It seems that stir4200 module need /dev/irda0 which doesn't exist. I'll request help from HK. BTW, I wanted to tell you that BlueTooth / a2dp works out of the box in your distro ! This is the first time I see this (even Ubuntu offcial release has trouble). So, bow ! and congratulations for your work. meveric wrote: So here's a very minimal Debian Jessie image for the ODROID XU3/XU4 series. Thanks a lot. Will be trying it out today. Do you have one for C1+? sandeep.rao wrote: Thanks a lot. Will be trying it out today. Do you have one for C1+? odroid wrote: Please search the forum. great work! runs immediately. thank you a lot! Last edited by andrewufrank on Sun Nov 29, 2015 12:33 am, edited 1 time in total. andrewufrank wrote: great work! runs immediately. thank you a lot! I haven't changed a lot of the default values so most configuration files are untouched. Kernel update is done by apt-get upgrade and apt-get dist-upgrade if a new Kernel is pushed. Please do not use odroid-utility for this. when installing, i see nothing on an attached monitor, neither when it boots nor does xfce start and show. access using ssh is working ok.
i have an xu4 and the screen is connected through hdmi - it works perfect with other boot images (ubuntu or arch-linux). what additional information would be helpful to understand the problem? normally it should show something on the screen no matter if you installed xfce or anything else. At least the console should show "something". Have you tried changing boot.ini setting a different resolution? Or switching from HDMI to DVI mode? What TV are you using? What's the native resolution for your TV? i knew that the console should show the log while booting - and the installation of xfce was ok, because i could use xrdp on a different computer. Hi meveric what driver to install to get my USB3.0 Gigabit Ethernet adapter to work? Pienoet wrote: Hi meveric what driver to install to get my USB3.0 Gigabit Ethernet adapter to work? well good question. For me it worked right out of the box. 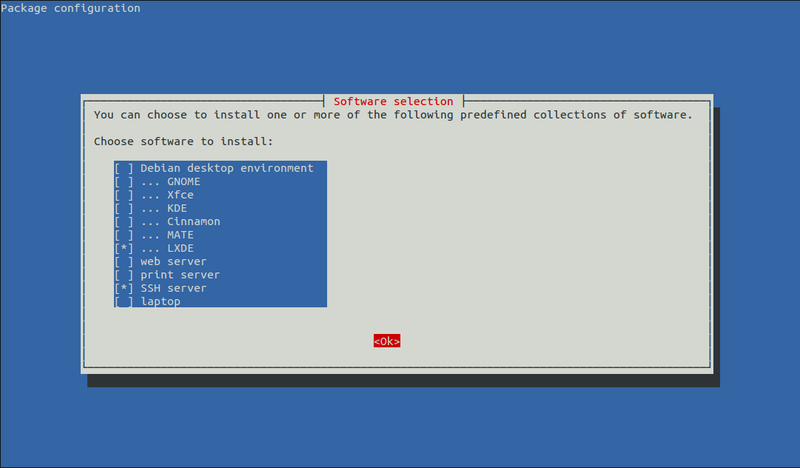 Are you using a desktop environment or just console? If console, have you added entries for eth1 in /etc/network/interfaces ? Check /var/log/syslog when you plug in the LAN adapter. It should tell you if the device was found or not. At the moment i'm reinstalling my desktop enviroment but the first time i installed a desktop enviroment to and the lan adaptor wasn't working too. When installation is finished i'll check /etc/network/interfaces and /var/log/syslog. With a desktop environment you don't need to alter /etc/network/interfaces. The Network Manager should take care of this. Only if you use console mode you might have to alter /etc/network/interfaces. But yes please check the syslog. kingdev1958 wrote: Quick question, how can I update chromium? it's running version 41, isn't that old? It wasn't really "old", but I took the time to compile Chromium 45 for Debian Jessie. Compiling Chromium is really a pain the the b*tt, pure compiling and package building time was about 12hrs. And I encounterd numerous problems while attempting to do so. The process uses VAST amounts of RAM during compiling and package creating, which for different reasons caused me to start over multiple times, so that in the end it took me nearly a week to get version 45 of Chromium compiled for Debian Jessie. meveric wrote: With a desktop environment you don't need to alter /etc/network/interfaces. The Network Manager should take care of this. Only if you use console mode you might have to alter /etc/network/interfaces. Can you pls tell me how to boot right into kodi? So i don't have to login after every reboot. Pienoet wrote: Can you pls tell me how to boot right into kodi? This will enable autologin for the user you selected, means on each boot this user will automatically be logged in without you having to enter password. There are two (probably more thant that) easy ways to enable boot directly into Kodi. I for example use MATE if i go to the control center, I have the option to add "startup programs" which are programs that should be started on system boot. Just add an entry for Kodi and everything is working. Similar settings/configurations should exist for LXDE or XFCE as well check the "start-menu"
There are more similar options, like adding options to a couple of different config files which can also turn on autostart of different applications, but these two are probably the two easierst options. If you "logout" from the desktop you will get to lightdm login window again. In the upper right corner (next to the power symbol) you can switch the default desktop session. Here you should find Kodi listed since we just copied it there. If you select Kodi and login as your desktop user, you will boot directly into Kodi. If you reboot from within Kodi you will always reboot directly into Kodi (since we already set your default user to auto login on reboot). Please note: You will have NO desktop loaded in the background, so if you quit Kodi you will end up on the login screen again. I choosed for option 2 and it works great! I have only one question left about deinterlacing when watching live tv. Am i right that deinterlacing is not working properly? Compared to my raspberry pi 2 my pi have much smoother videoplayback when playing sd en hd channels. I have only tvheadend client installed in my odroid XU3 and i stream from my tvheadend server installed in my pi2. Maybe i have better experience to install tvheadend server on my odroid? Or is this the best deinterlacing for odroid XU3?